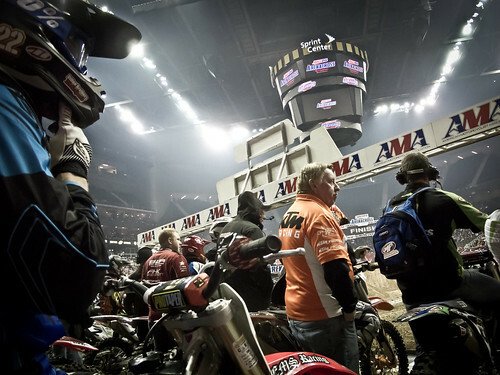 As mentioned previously on the Motocycle Closeouts Blog, the Amsoil Arenacross series had made it’s way to Kansas City! Indoor motocross action on a small, tight and very technical track meant lots of excitement, exhaust fumes and a bombastic atmosphere that produced oohs and aaahs all night long. From the stands, it was a show. From the track, it was a battle. The amount of access provided to us was unreal as we were allowed to walk the pits, talk to riders and really absorb what these guys and gals had to do to get not only their machines ready, but their bikes as well. The smell of race fuel burnt our eyes as we strolled the grounds and witnessed the prep and setup from factory teams rubbing shoulders with the home-grown boys that weren’t only riders, but also mechanics. We had crazy amounts of access and were able to view the racing from on track! One of the first races of the evening was the KTM Junior class which featured about a dozen boys and girls on small 65 SX bikes gunning for that pole position. We just happened to be in the rider’s pits when the race ended and these kids had obviously given it their all as they were exhausted and very emotional about the results. It was obvious who won, and of course, who didn’t win; it was tears or smiles. The winner of our Parts Unlimited Thor Phase Volcom gear, Andrew from Eudora, Kansas! We were invited to set up shop at the Sprint Center by Parts Unlimited. They were also kind enough to supply us with a set of Thor Phase Volcom gear to give away to a lucky fan. With a tent set up on the main concourse and a table out on track during the Track Party, we had nearly 300 motocross fans enter to win. Thanks to Bradi_S for having such killer gams! Thanks to everyone who stopped by our booths at the big show, regardless if it was just to say hi or just to win stuff. We also have a lot of thanks to give for this opportunity: Nick Spooner at Parts Unlimited, Bill Heras, Lauren Spindler and Rian Tipton at Feld Entertainment. Theo with Medusa Fabrication and Suzi Mears with Tornado Bait Motorcycling Road Racing Team for the crafty pictures of me during the giveaway! How close to the action were we? Does this answer that question? This entry was posted in Field Trip, Shows and tagged amsoil, arenacross, kansas city, medusa fabrication, monster energy, monster girls, moose racing, motocross, motorcycles, motorcycling, MX, parts unlimited, racing, sprint center, thor, thor official, tornado bait racing by MCCKeef. Bookmark the permalink.